Possibly my Best Award Season Ballot~ | personal.amy-wong.com - A Blog by Amy Wong. 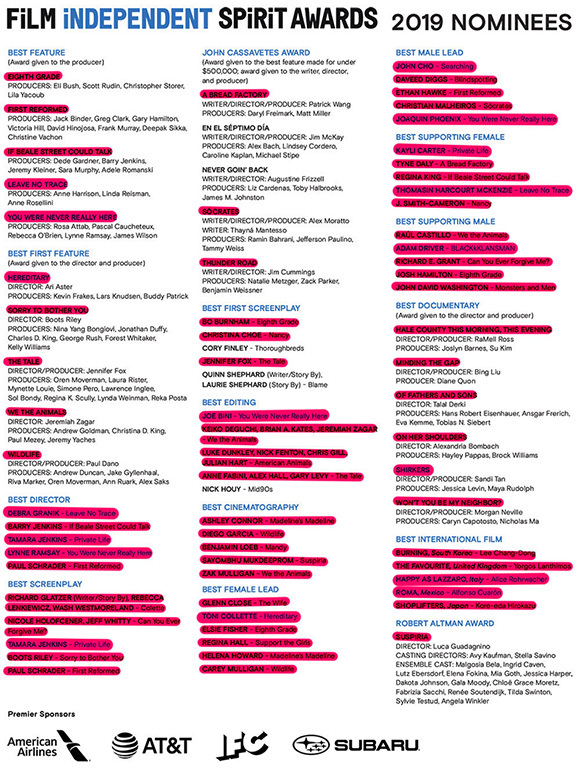 This is the first time I’ve seen more than half the nominees in the Documentary Feature category, LOL. And for the first time EVER, animated shorts were made available before nominations were announced. Spoiler: I’m surprised Pépé Le Morse [Vimeo] didn’t make the cut because it was one of my Top5. I’m rooting for Late Afternoon and One Small Step [Vimeo]. Overall, you’d know I’m so-so with [American] movies this year. And I think it reflects in the fact that out of the five Directing nominees, three are for foreign directors -mostly- doing foreign films. Also, someone explain to me how Slumdog Millionaire managed a SAG Award nomination for Best Ensemble, but no one bothered to do that for Koreeda’s Shoplifters? Salty, that’s what I am.